Vinsak is all set to unleash its full potential at the upcoming edition of Gulf Print Pack, one of the most important printing and packaging exhibitions in Dubai, 15 to 18 April 2019. At the show, the company will showcase live demos of Vinsak USAR 430 (Modular Slitter Re-winder) including VIS 1200 inkjet system for variable data printing. 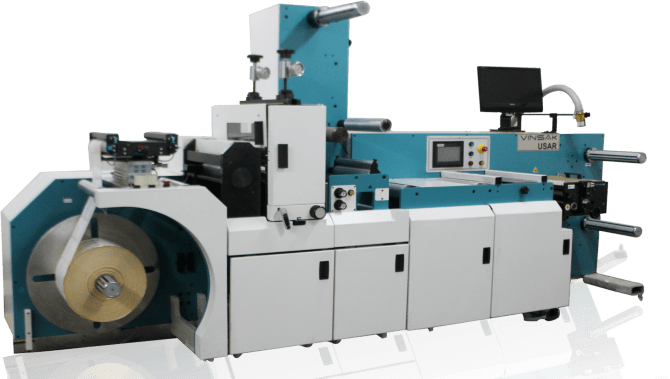 According to the company, Vinsak USAR is an excellent solution for buyers looking for affordable but efficient slitter and re-winder with upgradable options of diecutting, VDP and 100% inspection system. With all major components driven by servo motors, the equipment can run maximum up to 300 meters per minute. It is backed by powerful software and features a HMI display for easy job set-up and single window operation. Recently, Vinsak also introduced Vinsak USAR with variable cold-foiling and digital varnish about which the company will share more information at its stand. Vinsak Roll lifter, Vinsak TTR (Table Top re-winders) are other equipment that will be on display at the company’s stand. Nicola Lombardi, marketing head; and Giovanni Perego, international sales head of Lombardi, will also be present at the show to talk about the power and capabilities of Lombardi flexo press. Vinsak has been partners with Lombardi for several years now and has very strongly showcased and sold its presses in South Asia and Middle East. Lombardi has launched Wide Web Flexo press of 850mm width and available up to 1 meter as well. Vinsak also represents Iwasaki from Japan and with their intermittent-drive flexo press IF330 and TR2 UV offset printing machine it offers offset printing solution to the Middle East and India. Austrian based SPGPrints has recently chosen Vinsak as their new partners in the MEA region. With this alliance Vinsak will jointly offer prepress solution to the customer along with press and postpress that Vinsak already offers to cover the entire spectrum of printing process. Visitors will also be able to explore wide information on product rage like Rhino by Pantec for flatbed embossing and hologram in-setting systems, Petrel Security inks and Radus hologram applicator, RFID tag encoding and print personalization for smart products.